A warm welcome awaits all guests to our 200 year-old French country house set in the quiet, hillside hamlet of Auriac de Bourzac. 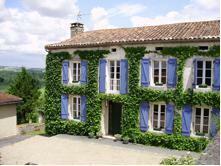 A peaceful haven and a perfect base for those wishing to explore the idyllic Perigord Vert and surrounding area. It is a paradise for country lovers offering much for walkers, bird-watchers, artists, or simply sun-seekers. Ideally placed as a base for house-hunters in the Northern Dordogne or Charente, being a 45 minute drive from Angouleme and similar from Perigueux. In the garden there is a beautiful lime tree providing shade from the summer sun, and a delightful terrace with stunning views where you can relax with a glass of wine. Guests are also welcome to use our spacious first floor salon with a grand piano. Two guest rooms are available: one double room with an ensuite bathroom and views over the hills, and one twin-bedded room with an adjacent bathroom and windows on two sides. Parking is available on the property. Guests may relax in the main salon as well as on the terrace. Breakfast is served in the dining room which is filled with beautiful English oak furniture. Auriac de Bourzac is perfectly situated for making morning, afternoon or full-day tours of the fascinating Perigord region. Numerous local restaurants are within a 15 minute drive (lunch costing around 11/12 €; dinner a little more). There are numerous ancient chateaux and grottos in the area, and every conceivable type of sport is also available, including ballooning, as well as rivers with sandy beaches suitable for swimming. Bethany is approximately 45 minutes drive south of Angouleme, or 90 minutes from Perigeux. Precise instructions will be provided upon booking confirmation.